These are my favourite cookies to make and now, dear blog readers, I will share with you the way of the Trilobite Cookie. 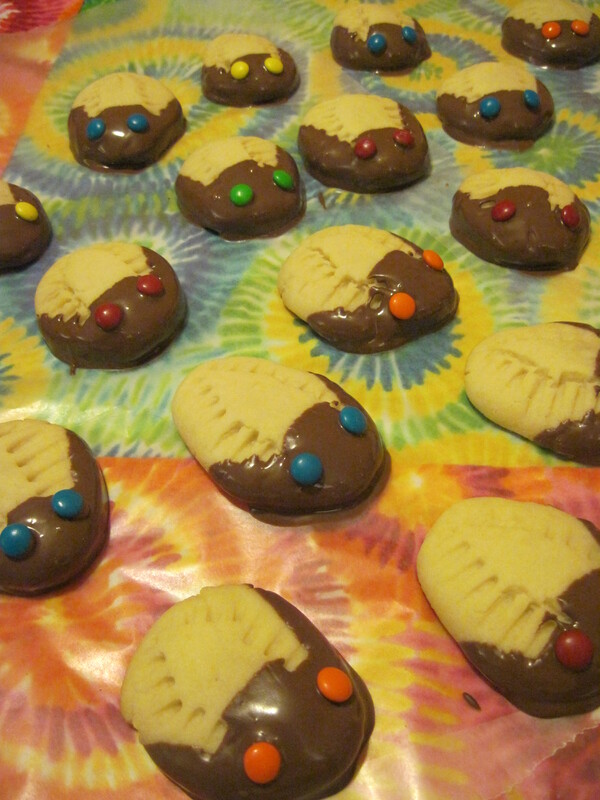 I first came across trilobite cookies via this webpage more than a decade ago, but I don’t have the tools for making press cookies (as fun as they are). Instead, I use a dense shortbread recipe (today I made gluten-free), and pretty much any basic flour+butter+sugar shortbread recipe will work. You will also need chocolate chips or baker’s chocolate, and something to make eyeballs with (I use mini-M&Ms, which are also gluten free). Once you’ve got your shortbread dough ready, you shape it into a small-ish ball and squish it flat, and stick it on a baking sheet. Take a small dessert fork and carefully squish some segments onto the dough. Don’t go all the way into the middle because you want there to be a slightly raised central area, and don’t go all the way to the front or back, because you need a cephalon and pygidium. Bake those puppies for 10 minutes! NOT LONGER! They should be just slightly brown on the bottom edge. Take them out of the oven and let them cool off almost completely – you don’t want them to be hot when you make the chocolate cephalons. If you are some kind of fancy, responsible adult and have a double-boiler, you can melt the chocolate that way. If you are a thirtysomething living the bachelor life and have a microwave, you can melt the chocolate in a bowl. But be warned that it’s really easy to burn chocolate this way and make it unuseable, so the trick is to heat it in 10-15 second intervals and stir vigorously. After about 5 or 6 of these heatups it will be ready! Take your trilobites by the trilobutts and dip the flat cephalon part straight down into the chocolate, then carefully tilt it to each side to make genal spines. You don’t have to make spines, but I think they look more like trilobites with them. It’s easiest to then put the cookies on wax paper and not directly onto a plate, since the chocolate unsticks from wax paper more easily. Stick the eyeballs on while the chocolate is still warm, and then stick the whole shebang in the fridge to get the chocolate to set. Voila, trilobite cookies that will make you the toast of the town! Enjoy! Oh! You just leave a little area at the back without any fork marks. Easy! Be careful, or these trilo-bites might be eaten by some eurypte-ribs. These are AWESOME!!!!! I bet a peanut butter cookie dough would work too.